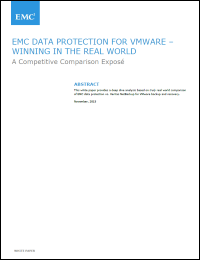 Download this white paper for a deep dive analysis based on truly real world comparison of EMC data protection vs. Veritas NetBackup for VMware backup and recovery. Gaining a holistic view of data protection for VMware workloads in real world scenarios is a challenge for many IT environments. This report highlight gaps and inaccuracies with the Veritas funded benchmark test by Principled Technologies.